If you have your heart set on a fairy tale like a wedding, your engagement party too should be equally happening. After all, it’s your first official day as a couple and you will only want the day to be a memorable one. The venue you choose plays an important role in creating these memories. Remember the movie Bride Wars, where the wedding venue was the cause of the rift between two besties; it is that important. So, why risk it when you can plan well in advance and have the perfect engagement hall. Planning becomes even easier when you have the list of recommendations ready with you. While there are numerous lists that need to be created we can help you here with the venue list. To select the perfect banquet halls for engagement, you must chalk down multiple aspects and then go ahead with considering the options. Keeping various things in mind we have compiled a list of banquet halls for engagement. Shangri-La Eros Hotel, Connaught Place, Delhi, is apt choice as an engagement banquet hall. Their signature theme combined with their signature service makes your special day as magical as the bond you promise to share with your partner. The decor team sets up the stunning stage while their chefs whip up an inviting feast for you and your guests, making it a day to remember. Calista Resort, Kapashera, Delhi has hosted many successful events like wedding ceremonies, engagement functions, reception nights and many more. It is well-known for the unmatched customer service and modern facilities. Its professional chefs will set up multiple buffet counters with delicious appetizers, tasty main courses and yummy desserts. D Imperia, Chattarpur, Delhi, has banquet halls as well as lawns for providing their clients with the best of options. It has party areas with a strong traditional touch and is best to organize wedding ceremonies and engagement parties. The venue provides an in-house catering team who can serve authentic Indian Cuisine to you and your guests. The luxurious décor of the venue gives a special touch to your big day. F&B Flora Farms, Chattarpur, Delhi caters to large and small scale events, plans beautiful, elegant and luxurious wedding functions. With a flexible approach to wedding planning, it has clients from all over the world and offers tailored services for individual needs. The management believes in commitment and high standards of service, excellence and attention to detail. Lawn parties have a charm of its own and the lawn here with a mid-sized capacity, makes to the list of our favorite venues for engagement. The Park Hotel, Connaught Place, New Delhi is undeniably an ideal abode for hosting weddings and other social events. This five-star luxurious property is blessed with beautiful architecture building in which state-of-the-art infrastructure adds more joy and convenience. The Park Hotel, Connaught Place, New Delhi also has dedicated decorators and caterers on board who can take care of everything on your big day, letting you enjoy the day to the fullest. Hotel Africa Avenue, G.K - 1, Delhi is situated in one of the posh areas and the venue holds a significant place among the most chosen hotels in Delhi, celebrating contemporary style and luxury. The venue serves a wide range of mouth-watering delicacies to choose from in both vegetarian and non-vegetarian food to your guests. The decor team takes care of the decoration for your big day. It serves alcohol and allows you to get it from outside to entice your guests. It offers complimentary changing room for the bride and the groom on their special day. Lagoona Emerald, Saket, Delhi is a great venue for hosting the wedding of your dreams and also for pre-wedding functions. The venue offers multiple wedding banquet halls and a lawn for hosting your engagement party. The venue gives you the freedom to get your own caterer from outside to serve your favourite cuisines to your guests. The decor team at this engagement party hall takes care of the decoration for your big day allowing you to sit back to enjoy your function. 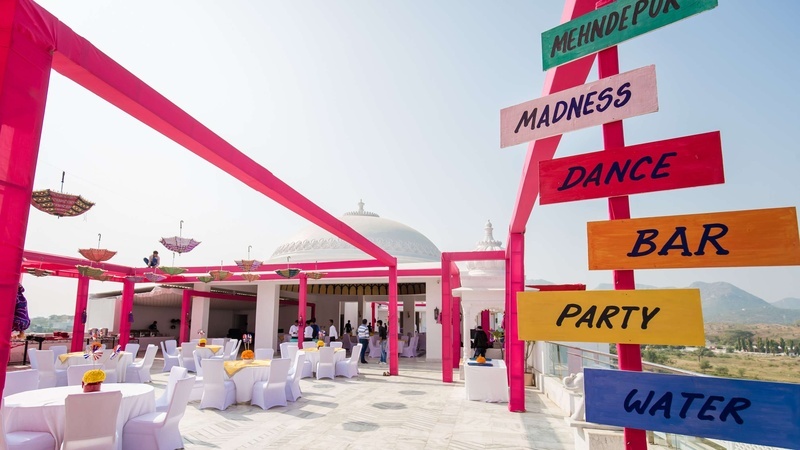 Satyam Farms, Indirapuram, Delhi is a popular name for events like wedding ceremonies, engagement functions, reception parties, birthday bashes and many other types of events. Located close to Ghaziabad, it has a huge lawn surrounded by natural greenery that is ideal to host an elaborated celebration for your engagement party. Perfect for setting up a grand stage and multiple buffet counters, the venue is equipped with in-house catering team that specializes in serving delicious food. Satyam Farms, Indirapuram, Delhi can also handle the decor of the big day as the décor team is proficient at providing contemporary designs. As the name suggest, The Party Junction, Dwarka, is the perfect blend of quality services and hospitality. The hotel's staff is trained to handle your events effortlessly and cater to all your needs. Synonymous with sophistication and a reliable reputation, it can be used to have a grand engagement party with exclusive arrangements. You can get caterers from outside and have an extensive menu for every occasion. The modern amenities at Party Junction, Dwarka, Delhi ensure that your wedding functions are planned without any delays. Orchid Valley, Faridabad, Delhi has amenities and services that will create moments to be cherished for a lifetime. The expert catering staff will assist you in providing your guests with delicious food on your special day. With a lush green spacious lawn, this banquet hall for engagement party can accommodate anything from small gatherings to large receptions. Located near Manav Rachna International School, Orchid Valley, Faridabad is a perfect wedding venue and is the prime choice to host a grand wedding.